Unlawful, a fiery and no-frills trio hailing from Columbus, OH, have recently released a new four track EP titled Unlawful II. Made up of vocalist Devin Sahr, guitarist Jeromy Sahr, and cellist Kyle Chatfield, Unlawful creates straightforward songs, both lyrically and musically, that have the ability to cross over into various genres while still maintaining a classic feel. This straight-to-the-point EP opens the door to Unlawful's world with "In Hell," which is a fantastic starting point in terms of getting to know Unlawful's style. With a simple chorus of "Oh baby, why'd you do it? / I'm in hell / By myself / I'm in hell 'cause there's nobody else," Devin's raw, natural voice shines through and truly drives the song forward, as this track is carried by the vocals rather than the instruments. The backing guitar rhythm and cello do help to carve out the bands seemingly staple sound, however, and have larger parts on the following three songs. The second track, "Set It On Fire," is a catchy and effortlessly relatable track, with a chorus that just won't quit -- "I need a drink / I need a lighter / Give me the night / I'm gonna set it on fire." The track has a clear classic throwback feel to it in the best sort of way without feeling overdone or boring. The next song, "Joe - Extended," is essentially a two for one deal. Out of the four tracks on the EP, this track has a clear storytelling element to it, and easily paints a picture in your mind as it goes on. While reminiscent of similar artists (Tim Barry immediately comes to mind), Unlawful forge their own path rather than following the same track as other artists. The "Extended" aspect includes a separate song that is the only one on the EP with Jeromy singing lead vocals rather than Devin. While it could have been a stand alone song, the DIY element of its overall sound solidifies its fun, seemingly lighthearted intention. 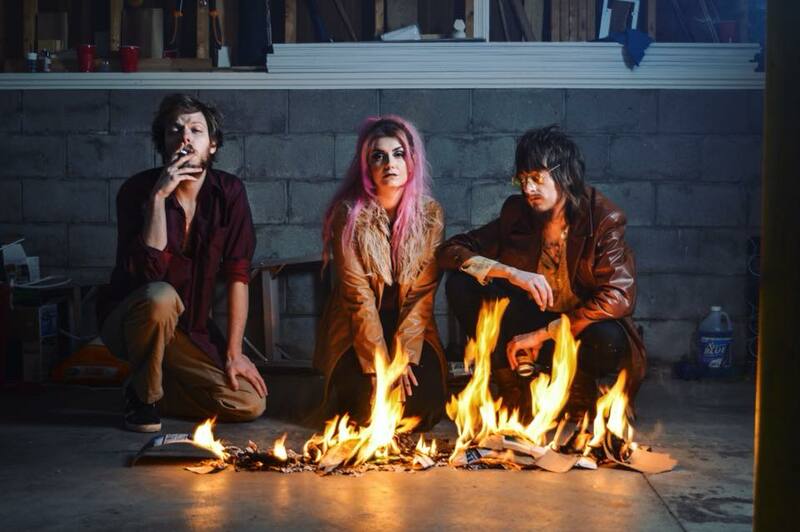 Ending the EP with "Up In Smoke," Unlawful pick up the pace a bit as this track has the busiest and fullest sound to it compared to the previous three, which is an enjoyable change. Devon's vocals are a bit softer are smoother on this track, without loosing their signature edge. Overall, Unlawful II showcases the trios musical growth since their previous self-titled release from 2016, complete with a full, confident sound that knows when less is more, and doesn't feel forced or over the top. You can listen to Unlawful II on both Spotify and Bandcamp, and you can stay up to date with the band on Facebook. Continue reading below for an interview with Devin, as well as to watch the music video for "Set It On Fire" and to see the dates for their upcoming shows! Q: What lead to you and Jeromy deciding to form a band -- had you both been in previous projects prior to forming Unlawful? A: Jeromy and I started dating in 2010, and we were actually both working on our own projects at the time. We both kind of actually just stopped making music for a few years as we settled into our relationship and got married. The music we made previous to Unlawful was drastically different from each other, and what we're doing now. We thought people were crazy when they suggested we do something musical together. Jeromy had made acoustic songs about heartbreak, and I was making indie pop Myspace music that showcased my childhood dream of being Britney Spears. It was in 2015 I think, that Jeromy started picking up the guitar again, and I was listening to a lot of classic rock albums and feeling inspired so I asked him if he could write to this song I was humming in the shower and that's how Unlawful began. Q: "Set It On Fire" is my personal favorite track from Unlawful II. Which track is your favorite, both to perform and to hear the finished recording of? A: Thank you! "Set It On Fire" has been a surprise favorite among our listeners and that's why we chose it to be the first video off of the EP. This EP is like our baby and while it's hard to pick favorites, we all agree that "In Hell" is our favorite to play live, and it's also Jeromy's favorite song on the EP. We all get super into it on stage and it feels brand new and fresh each time because the energy is so big. It's like that with all the material we're taking on tour because we all believe so much in the content. "In Hell" just has a certain groove to it. "Up In Smoke" is mine and Kyle's favorite. I would say that's because it's the most complexly written song on the EP, and it just feels like it had the most pay off when we got back the final recording. We wrote it just a couple weeks before we took it to the studio and made a last minute decision to remove a song so "Up In Smoke" could take its place. Q: Who came up with the concept for your music video for "Set It On Fire", and where was it filmed? A: We are very lucky that one of our closest friends, Nich Corbett, is a very talented photographer and videographer. He's done all of our photos and videos. He texted me and suggested we burn a "dead body" and we were all super excited. It was something totally different for us and it shed a different light on our song. I think that's what's so cool about art, and collaborating with other creative people. He knew that the theme of our EP was burning bridges and fire and smoke and starting over, and he gave us something that symbolized that in a way that we wouldn't have ever thought of. We filmed it on a farm in Newark, OH and had to film around cows. It was like -3 degrees but totally worth it. Q: What was the process of discovering Unlawful's true sound -- was there a specific moment where it felt like everything fell into place? A: It was definitely when we added the cello. Kyle is beyond talented and has been rooting for us as a friend since day one. He always loved the music and believed in what we were doing, and we had been trying to talk him into being in the band for a couple of years before it ever came to be. So when we seriously started jamming with him, none of us, not even Kyle could deny that we were onto something awesome. The cello added a much warmer and fuller sound to the songs we already had and gave them a different personality, and it definitely influenced how we wrote going forward. Kyle is great at matching the emotion or vibe for anything we lay in front of him. Q: What can people expect to experience at your live performances, especially at smaller, more intimate venues, such as the ones that you'll be performing at on your upcoming run of shows? A: We want seeing us live to be an interactive experience. We want to get to know our audience and we want them to get to know us, both on and off stage. We've found that it's much easier to make those personal connections in the smaller venues. Coffee shops have become some of our favorite places to play because we get to hang out with our crowd and show them our music in an up close and personal setting. We're also very particular about not adding a lot of instruments or sounds during recording that you wouldn't hear us play live, so you're getting a very raw and organic performance true to what you'd hear on the EP. Unlawful are heading out on a short run of shows next month at some small, intimate venues.